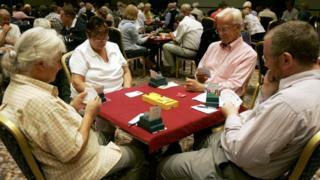 The head of funding body Sport England has defended its decision not to class the card game bridge as a sport, as a judicial review into the ruling began. Phil Smith said Sport England's job was to promote fitness and bridge "isn't getting the nation any fitter". But the English Bridge Union argues it has health benefits for the mind. The Royal Courts of Justice will not decide if bridge is a sport - only whether it was reasonable for Sport England to have ruled it was not. Sport England distributes government and National Lottery funding, so reclassification would make bridge clubs eligible for grants and could help boost participation. Lawyers for the English Bridge Union (EBU), which has 55,000 members, told the High Court bridge was based on rules, fairness and competition - just like other activities classified as sports. Richard Clayton QC argued that the meaning of "sport" in the 1996 Royal Charter which established Sport England was sufficiently broad not necessarily to require physical activity. He also said bridge was one of a smaller number of sports available to older people, to whom it brought a vital sense of inclusion and community. Do bridge and chess make you fitter? Sport England, taking its lead from the Council of Europe, defines a sport as an "activity aimed at improving physical fitness and well-being, forming social relations and gaining results in competition". It has argued that bridge is no more of a sporting activity than "sitting at home, reading a book". Ben Jaffey, lawyer for the Department for Culture, Media and Sport, told the court: "There is nothing objectionable about bridge, chess or similar mind games, but the sports councils are entitled to separate mind games from physical activities when deciding who to recognise." He said the government could choose to provide funding for bridge, "but the route to achieving that result is by applying for funding under an appropriate category". The EBU says it has the definition of sport in the 2011 Charities Act on its side - activities "which promote health involving physical or mental skill or exertion" - as well as the International Olympic Committee, which said in 1999 that bridge and chess should be considered "mind sports". They are not currently part of the Olympic Games programme, but organisers of the 2020 summer Games in Tokyo have invited both chess and bridge to apply for inclusion, with the decision to be made next year. Phil Smith, director of Sport England, told BBC Radio 5 live the argument ultimately came down to money and his organisation must spend its "precious funding" on activities which improve physical health. "It's Sport England's job to get the nation fitter," he said. "And although bridge is a fantastic pursuit, and we think it probably gives pleasure to a lot of people, it certainly isn't getting the nation any fitter." Mr Smith said classifying bridge as a sport would also "open the door" to other pursuits like chess and Scrabble to "dilute" Sport England's budget. But Heather Dhondy, a member of England's women's bridge team, said the card game "doesn't involve a great deal of physical activity", but players still had to be physically fit. "We can be playing up to nine hours a day," she added. Separately the EBU has also mounted a legal challenge to a decision by HM Revenue and Customs that bridge is not a sport and is not therefore exempt from VAT. Bridge, or contract bridge, is a card game played by four players who form two partnerships. It uses a standard 52-card deck and involves bets being made on the number of tricks each side will win.